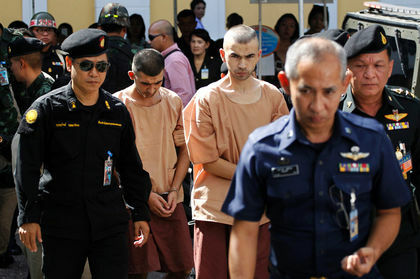 BANGKOK -- A Thai military court on Tuesday indicted two foreigners accused of carrying out a deadly bombing at a shrine in Bangkok but questions hang over the case because of the attackers' unclear motive and an opaque investigation. Both men have been described by officials as ethnic Uighurs (pronounced "wee-ghurs") from western China's Xinjiang region. Officials say the blast was carried out by a people-smuggling gang seeking revenge on Thai authorities for cracking down on their operation. The Aug. 17 blast at the Erawan Shrine -- a popular tourist destination -- was one of the most deadly acts of violence in Bangkok in decades, and left 20 people dead and more than 120 injured. Of the dead, 14 were tourists. The two suspects were brought to the court in handcuffs wearing brown prison garb. Members of the media were not allowed to enter the court and the indictments took place before the two suspects arrived, said defence lawyer Chuchart Kanpai. The two, identified as Bilal Mohammad and Mieraili Yusufu, were indicted on 10 counts -- none of them terrorism charges. They include conspiracy to explode bombs and commit premeditated murder, Chuchart said. They are being tried at a military court on an army base in Bangkok because cases of "national security" have been handled by the military since last May, when the army seized power in a coup from an elected government.